How the teachings of the Bible are related to the Law of Attraction is an important question. Many people want you to believe that the Law of Attraction is evil because it is focused on materialism. And while many Law of Attraction teachers focus on money and other material objects, if you look deeper, you’ll see that the Law of Attraction is spiritual in nature. In fact, Jesus taught the Law of Attraction even though he never called it that. Matthew 21:22 states “And all things, whatsoever ye shall ask in prayer, believe, you shall receive it”. So what is the Bible telling us here? When you pray to God, askHim for whatever you want. Ask as if you expect to get it. Have unwavering certainty that God has answered your prayers. If you do this, you will receive it. This is exactly what the Law of Attraction teaches when it tells you the three steps to get what you want are to ask, believe and receive. It tells you to get clear on what you want and to ask for it. Believe that your desire will manifest by acting as if you already have it – be the person you would be, do the things you would do. If you do this, you will make it manifest into physical reality. 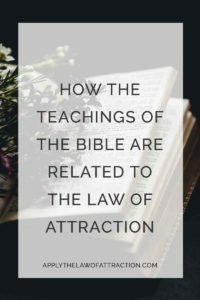 Now, I could keep going on for hours on the similarities between the Law of Attraction and the Bible to prove my point, but it’s much easier to explain how the teachings of the Bible are related to the Law of Attraction by just telling you like it is. You see, Law of Attraction teachers just don’t say it because they think that if they did, they would scare away customers and make less money. …the Law of Attraction is centered in the Bible.